Walkandtalk: Care for a FONDUE in the sun? Care for a FONDUE in the sun? As Decembers go, this one ranks amongst the best for early snowshoeing at low(ish) altitudes. Jean-Marc from Natscape (www.natscape.ch) hired me (thanks!) 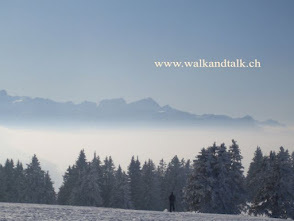 for a snowshoe outing above Montreux, on the flanks of the Molard, a modest summit but with amazing views over the whole Leman lake and the Alps. JM went up ahead with his pulka to cut wood, start the fire and get the fondue going. I waited for our clients to turn up and we set off in the blazing sun and the freezing air (-7 centigrades). 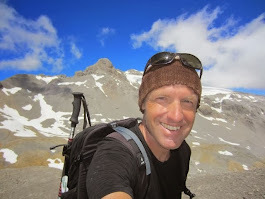 The walk up -about 2 hours- was pure pleasure, with animal tracks to discover, great views and cool clients that didn't bury me in the snow when the ten minutes announced to get to the fondue changed into 20! Fondue time, with a bird's view over the Alps! After a meringue and creme dessert, time to go down, shorter, faster! Last meters, we're back to the starting point, evening colours are already setting in. Back there in the distance, it's the Jura mountains and in-between them and that cool white hat, the Leman lake stretches out towards Geneva, which -as usual!- is covered up by the "sea of mist", as we call it over here (poor Geneva folks! ).